FORT Youth Ministry is excited to announce the details of this year’s youth camp! We hope that all our youths (11-25 years old) will be able to join us for 4D3N of encountering God and committing our lives to Him. Our hope is that through this camp, our youths can learn the importance of finding their rest and strength in Christ, surrendering all their hopes and fears to Him. Registration closes on 25 Nov. Registration Forms can be obtained at Reception Counter after 8 and 10.30 services at church. Ps Byron had a fulfilling career serving God in the marketplace when God re-directed him to serve in church. He obeyed God and now serves as a Methodist pastor at Bedok Methodist Church. 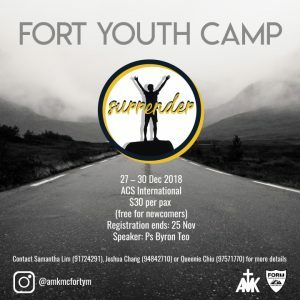 You can follow us on Instagram at @amkmcfortym for more updates and details about Youth Camp and FORT Youth Ministry.